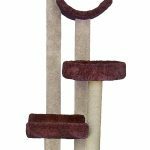 This is a sturdy 2-tier cat tree that is of the highest quality, handmade by a company named Molly and Friends. Don’t let the size fool you, it’s not as tall or crazy looking at some of other cat trees we reviewed. However, it is of the highest construction quality and the platforms are large and comfortable, appealing to any cat of any size, even the largest cats. The pine poles are the main reason for the sturdy nature of this cat tree. The tallest pole is wrapped with sisal rope, cats large and small can scratch and stretch at the same time on this pole. The other is carpeted. The rest of the structure, including the undersides of the platforms, is also covered in high quality carpet. No seams or staples are in sight. Your cats will love lounging on the large platforms, they are wide and the carpet is soft and thick. The largest cats will even find the scoop to be quite comfortable too. What else can be said about this cat tree? Oh yeah, you won’t need to assemble it either, it will get shipped to you in one piece. After shipping, you can simply move it to where you want it to sit, and your cats will be able to enjoy it as soon as they warm up to it. Shipping comments? People say the box is big. And some say that the box looks a little sloppy, but that the unit is always in good shape after delivery. People also love the fact that they don’t need to assemble anything. Many cat trees come shipped in flat boxes, needing to be assembled, but not these cat trees from Molly and Friends. How sturdy is it? Buyers say that this is a very sturdy cat tree. Their cats of all sizes jump and play on this cat tree and it doesn’t wobble or tip at all. Even the people that have the biggest of cats say that their cats are able to enjoy this cat tree without any restraints. That is just how large and comfortable the platforms are. Another common comment is that all sizes of cats can get a good stretch while scratching on these posts. This is important, and helps to encourage cats to use it, since it will be their best scratching option from their point of view (rather than your furniture). The comments on the carpeting are all positive as well. People are impressed with the thick carpet and the quality feel. Some are even surprised to find that the bottoms of the platforms are carpeted too, which isn’t a terribly common practice in the cat tree construction world. Overall, people are very happy with this cat tree. 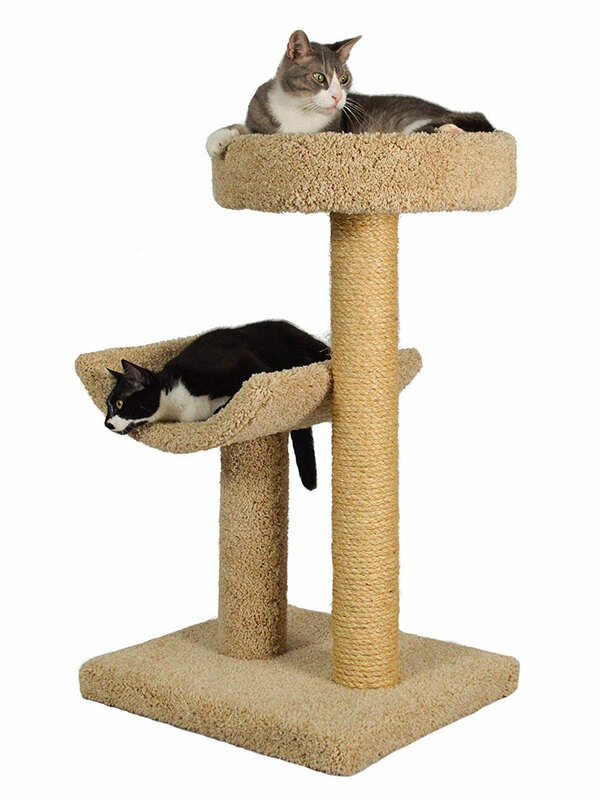 It’s a good pick for anybody that wants the highest quality 2-tier cat tree possible. What is the selling price of this cat tree? I currently own one in a light beige/oatmeal color (like the color in the photo on this screen). Is it still available in this lighter beige color? I just ordered one from Amazon that was supposed to be beige, but a brown one was delivered. I returned it. Thank you. I think it can be ordered online yet for about $110-$130 depending on where you get it. Sometimes they change colors of carpeting depending on what’s available during construction. It kinda does stink though when you order one color and get another, especially when it’s not similar.